The Axiom Flip Flop DLX is the flagship model in a range of quick release, seatpost mounted racks aimed at commuters and others seeking to lug light to moderate loads without using traditional three/four point racks. First and foremost, the fifteen kilo load capacity is quite a bit, creeping close to half the capacity of my mono-wheel Yak clone trailer. When it comes to racks, I'm firmly of the opinion that they should be welded together, so I was quite surprised that the Flip Flop DLX is a two piece, detachable design. This enables the beam to rotate, theoretically accommodating most types of bike, though getting it to sit low proved difficult. The main body is welded from tubular T6 6061 aluminium to Axiom's usual, very high standard, and the satin black powder coat finish is also very good. It comes with a lifetime warrantee against manufacturing defects. A generous top platform doubles as a reasonably competent splash guard, while offering a solid mount for bigger trunk bags. The pannier frames at the sides comfortably accommodate 16 litre Rixen Kaul bags, though a layer or so of electrical tape where they make contact helps prevent premature wear. However, a two tier rack is more convenient if you combine panniers and trunk bag. The clamps on racks like this tend to be agricultural and the DLX is no exception, though its quick release cam closure is a reasonably secure fit around most seatpost diameters. Despite the decent rubberised shim supplied, I'm not overly happy heavily loading a carbon fibre seatpost or the prospect of some long suffering A&E nurse extracting shards from my derriere. I've therefore limited my use of the Axiom Flip Flop DLX to sturdy aluminium alloy and titanium posts. Overall performance has been middling. The Axiom Flip Flop DLX works best on smaller mountain/semi compact geometry framesets with healthy amounts of exposed post. 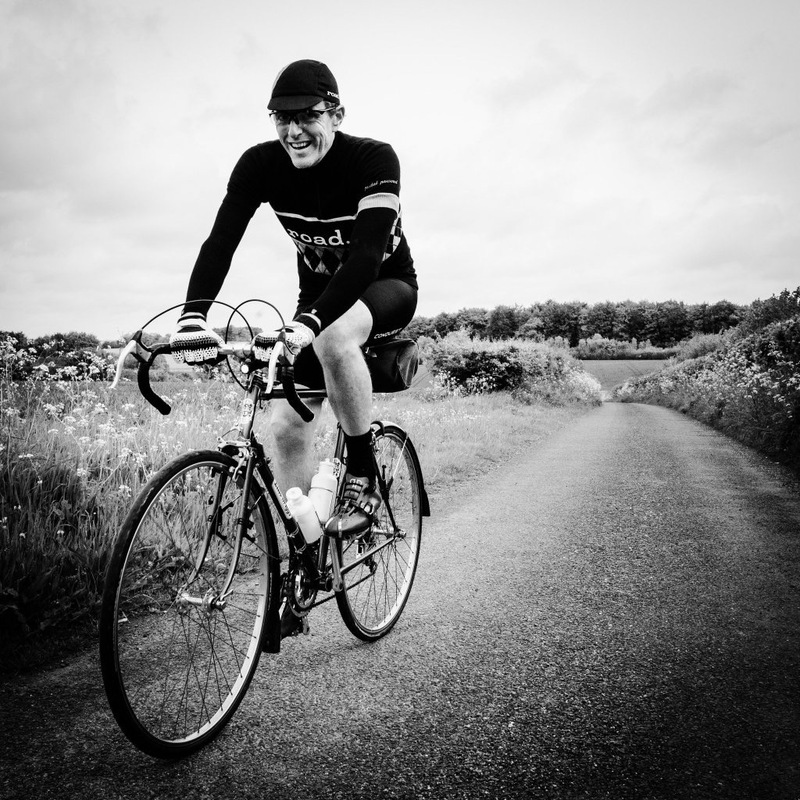 The luggage is still placed relatively high, which can do interesting things to your bike's handling, especially during long, steady canters through exposed areas with strong crosswinds. 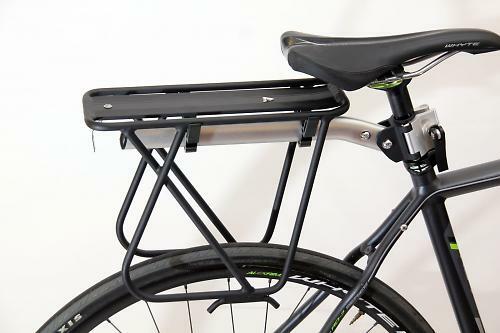 While I'm confident the rack's structure will hold the full 15kg claimed load capacity, a four-bolt stem-type clamp would make this more of a practical proposition. In practice, following my usual tentative bedding-in outings with a couple of evenly balanced kilos, I still found myself stopping eight times to realign the rack and nip the clamo tight during a forty mile run with half the maximum payload. Here's a video from Axiom explaining the DLX and the rest of the Flip Flop range. Ideal for rear suspension bicycles". Felt adequate in some contexts but disappointing by Axiom's usual standards of design. General quality of materials, welding and finish are to Axiom's usual high standards. Convenient to whip on/off in the proverbial trice but places loads quite high, which has an effect on handling/comfort beyond a certain point, especially combining smaller panniers and trunk bag. Overall, this has been one of the better post clamping designs and fine for occasional hauling of larger, lighter loads-especially in situations where traditional 3/4point racks aren't compatible with machines or rider taste. Convenient to fit, nice welds and finish. Places weight too high, which can adversely affect handling and I feel a four bolt stem-type clamping system would be a better choice for the loads suggested. Did you enjoy using the product? Disappointing overall. Would you recommend the product to a friend? Not in its present guise. The published pictures would look less odd if you'd rotated the rack 180 degrees around the silver support tube before mounting the entire rack to the seat post. 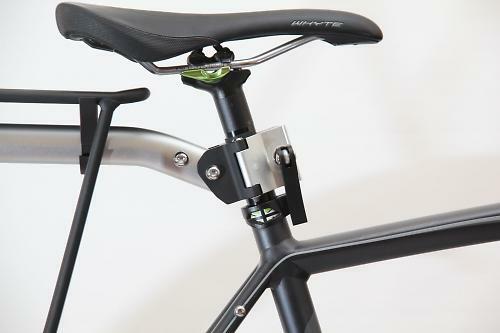 The rack can slide along the tube to avoid catching the seat stays, as the video shows. I use a Topeak beam rack with a very similar mounting, and the only time it shifts is when I haven't clamped it firmly. This review sounds like Shaun the reviewer didn't use the main USP - the 'flip-flop' feature. And I find it hard to believe that they released a product that required frequent stopping over a short ride to re-tighten. Sounds like user error or a faulty item. Agree with Dr_Lex - the photo looks like it was shot by a competitor out to make the product look unusable. And no, you should ***NEVER*** clamp carbon - anywhere except using the manufacturer-approved seatclamp, set to the correct torque. Adding a 'four-bolt stem-type clamp' as suggested would make this a total faff - it's supposed to be a *quick release* rack. The hint's in the product line. Having watched the video, I'm now likely to buy one for the flip-flop and sliding tray features. This review isn't your proudest moment, Road.CC.